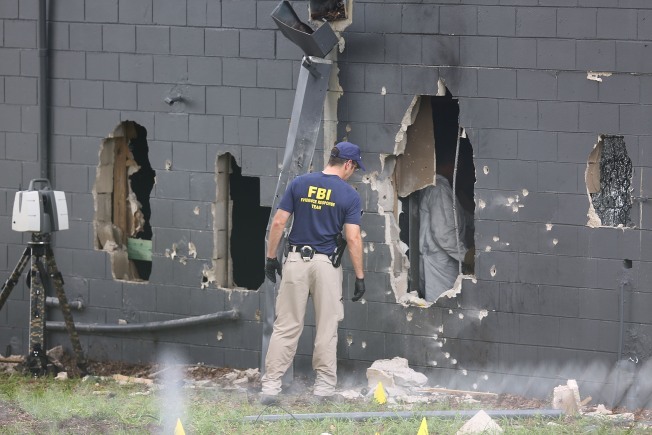 FBI agents investigate near the damaged rear wall of the Pulse nightclub where Omar Mateen killed 49 people on June 12, 2016, in Orlando, Florida. Police released logs from the Orlando massacre on Tuesday, providing a narrative of the horror inside the Pulse nightclub on June 12. The document includes the notes that 911 dispatchers took on what callers were telling them and what officers were saying over their radios over the course of three hours, NBC News reported. The timeline begins with "Shots fired" entry at 2:02 a.m. Note after note laid bare the fear, panic and carnage that filled the club where 49 victims were killed before gunman Omar Mateen was shot dead by police. In the first few minutes, dispatchers could hear gunfire, cries for help, and heartbreaking silence. As clubgoers ran for their lives to various corners of the building, calls came in from restrooms, the kitchen, an office. The entry at 5:15 a.m. ET, "Subj down" marks the end of the bloodshed.